During a shopping trip to IKEA a few weeks ago in Stoughton, MA, I discovered some vegan caviar (made almost entirely from seaweed extract and salt) in the food section for $1.99. Although I’ve never had real caviar, this product has a nice texture and a briny bite to it. I’ve used it here to top off some corn pancakes separated by layers of chive-kissed dollops of vegan sour cream. This is a fantastic brunch item that looks amazing on a plate, but is really simple to throw together in just a few steps. Whisk the vegan milk, vinegar and baking soda together in a glass measuring cup. Allow it so sit for about 10 minutes to thicken, then whisk in the rest of the ingredients. In a separate medium-sized bowl, combine the flours and sugar. Make a well in the middle and pour the wet ingredients into it. Stir slowly and gently until combined. Don’t overstir or the pancakes will be tough. If you have time, let the batter sit for 20 minutes or so before you make the pancakes (although this isn’t necessary). Preheat a griddle over medium-high heat for about 7 minutes. 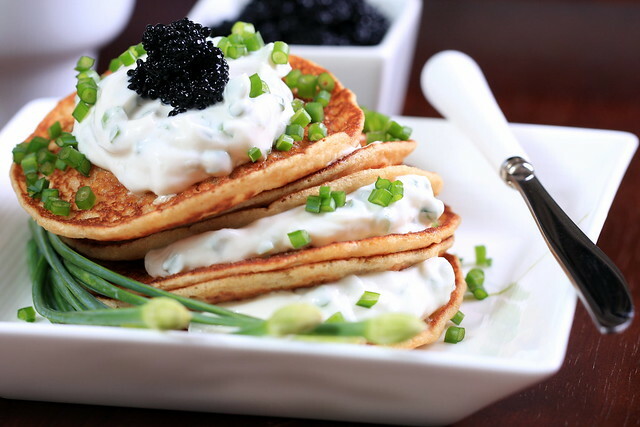 While you are waiting for the griddle to preheat, combine the chives with the vegan sour cream and set aside. Once the griddle is ready, spray it with a little cooking spray. Ladle the batter onto the hot griddle using a tablespoon. After 2-3 minutes, flip them and let the other side brown for an additional 1-2 minutes. Top the pancakes with the prepared Tofutti/chive mixture and finish with a bit of the IKEA caviar. i LOVE that second photo! the savory pancakes look delicious and how awesome is it that ikea sells vegan caviar?? i had caviar once when i was really young, maybe 6 or 8. all i really remember is that it was salty. I know, I was surprised to see the caviar among all of the other fishy products at IKEA, and just baffled (but delighted) they have this product! I know, isn't the grocery section amazing? And I love that IKEA's food is so cheap — I also brought a ton of bread and jelly on that trip for about ten bucks! You've inspired me to go to Ikea! I love how you took an item and conjured up a beautiful dish. I wish I had the same price…1.99. I see in the link its now $29. This looks fantastic!!!!!!! Pinning this one for later. The pictures are so gorgeous! I never had vegan caviar, but you made me curious. But I bed your pancakes are awesome without it, too. this looks amazing!! and i need to try that caviar! i never had real caviar but i love trying vegetarian alternatives to meat foods! These look great, I definitely want to give them a try! Can you clarify the dry ingredients for me? I assume that "1 1/4 flour" means one and a quarter CUPS of flour? Any particular kind of flour? The recipe is called "Savory Corn Pancakes"–does the title flavor come from that 1 TB corn flour? Does one tbsp corn flour influence the flavor/texture that much, or is there another corn ingredient I'm missing? And finally, I am about 5 hours' drive from the nearest IKEA, can you suggest a substitute that might provide a similar flavor effect? Thanks! Thanks! I corrected the recipe to reflect cups for the flour. The corn flour gives it a slight cornbread taste/texture, but I suspect if you leave it out, the pancakes would still taste really good. oh my, you always make such interesting things. 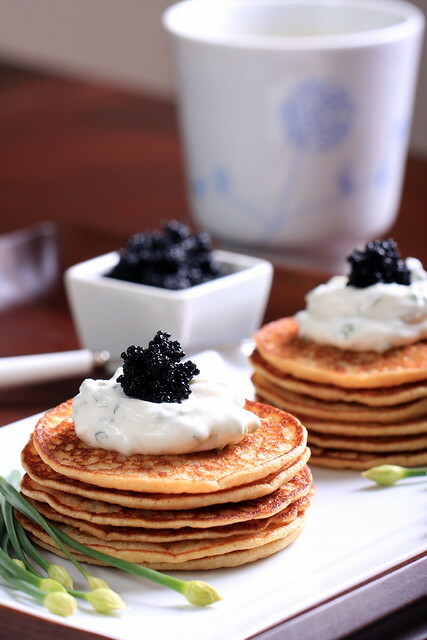 the pancakes with the delicate caviar. i have never had caviar real or not, so this should be interesting. Thanks Richa! I think vegan caviar is so intriguing — there are so many ways to make it and so many things to put it on! So jealous you could find vegan caviar! I'd have to special order some from a company in Quebec and shipping is ridiculous! Wait, what? Vegan caviar at Ikea?! I should have looked more closely at their food section, as I thought it was all Swedish meatballs. Was it worth the price, in your opinion? Becky, I found the caviar for $1.99, so it was definitely worth the price!